Below is one of the slides in today’s presentation by Dr. Gail Naughton. Self-explanatory. I wonder why the terminal hair count diminished with time? » I wonder why the terminal hair count diminished with time? Good question, the 5 months photos are clearly better than the 3 months, could that be a typo Hairsite? 5 month photos of another trial patient. This might be a stupid question, but… Does anyone know roughly what a hair count would be in an area the size of a nickel on a normal head of hair? ie. How would the density compare to a person with a full head of hair. I dont know but I suppose the pic with 433 hair count x 4 would probably be a good estimate of what a normal full head of hair looks like, don’t you think? Yeah, sounds like a reasonable amount. Just read on another site that Histogen plan on trialing it in asia first with 300 participants. If the trial is successful, they want to release it in Asia afterwards, so no fda trials. Can Hairsite confirm if this information is correct? So, what’s the next step here? It supposedly increases hair count, but does the hair stay forever? can this be applied to the rest of the scalp? » the hair stay forever? can this be applied to the rest of the scalp? If the asian trial is succesful, they can go directly to market in asia, excluding Japan…no more waiting. Then they will look to the US. 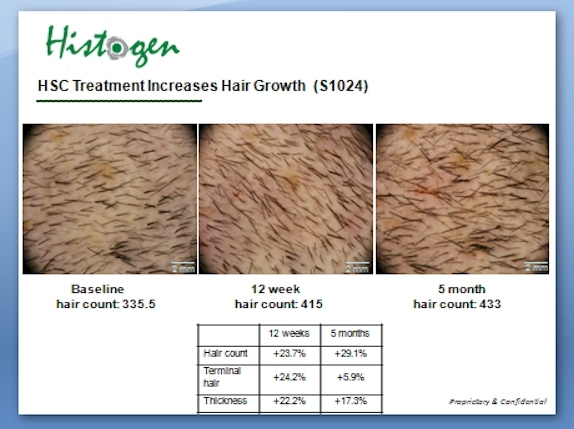 They showed 2 photos at the 5 month mark with the average increase in hair being over 20% with a single injection…some over 40%. The photos, like those seen on their website, are of an area the size a nickel. A 20% increase in this nickel sized area was equivalent to 100 additional hairs. They say there were absolutely no safety issues and they feel like they can increase the effectivenes with multiple injections or by increasing the dosage. this was an investment raising presentation (it’s expected they would) paint a very promising picture. They are waiting for a ruling on their lawsuit motion for Summary Judgement. HSC is not a subject of the lawsuit. The new hair will almost certainly be susceptible to DHT. 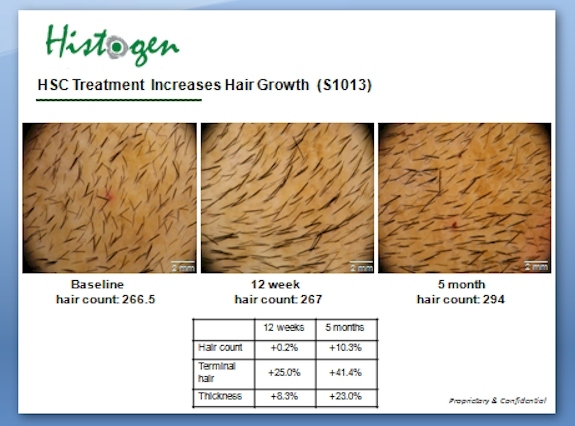 Histogen have admitted this, saying that “if it took 30 years for your old hair to fall out, it should take 30 years for the new hair to fall out”. I am just speculating, but a way round this problem might be a top up every year to keep the new hair in a growth phase? We dont know, but this problem could be massive in terms of cost effectiveness ie. 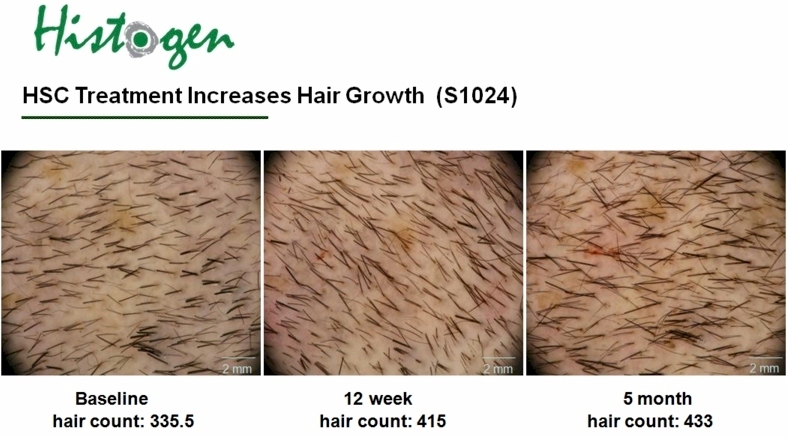 it costs a lot for hair thats gone in a few years. I was wondering how HSC would act on the rest of the scalp aswell. We wont know until they start doing trials on the temples and front of the scalp. Maybe one of the guys on the site who are more knowledgeable than me could have a guess? I mean, will it give a hairline, or will an injection at the front lead to hair growing on your forehead. What’s the point theses guys are at least 8- 10yrs away from market! » What’s the point theses guys are at least 8- 10yrs away from market! Histogen them selves said them selves that the expected US release date if all goes well is 2015, so thats not 8-10 years away! If you read up the page, it says they are planing an Asian clinical trial to possibly release even sooner. » » What’s the point theses guys are at least 8- 10yrs away from market! » all goes well is 2015, so thats not 8-10 years away! » to possibly release even sooner. I have much respect for how Naughton runs her company, very well put together operation. Sad to say as I am from Canada orig, but I feel as if a few goons from Trick o science, have been posting on here, and it just makes me not like the co already. I can’t say I am not excited over these pictures, my only question is whether the 5month result is from just 1 injection? I am not impressed with these results at all…they still look bald to me…just a little more hair…actualy it just looks like the hair is longer in 5mth pic than from the initial…if u look at a guy with normal hair u can see his scalp even when its shaven down…i know this is maginified but still it doesnt impress me…and 2015 fk it…6 yrs away…they will have some probs and discontinue it off the market just like every other drug…blah blah…merk wins again!!! » whether the 5month result is from just 1 injection? Yes, the photos you see are the results from 1 injection only, including the 5 months’. I would of thought the big question is does it work on totally bald areas or just on thinning hair,as in photos. This is very promising if what we see if from 1 treatment only, but then the most important question as always is when will this hit the market? Someone in a previous post said they will introduce this in Asia first, is this true and when will it be available in the US? explanation why terminal hair count diminished with time for one of the patient pics? does it work on bald or balding (thinning hair) heads only or both?